X-Yachts is rounding out the cruising line with their smallest model yet. The XC-35 might be short and compact, but it is big in terms of comfort and performance. Brothers Niels and Lars Jeppesen built their first boat with their mutual friend Birger Hansen in a small shed in Haderslev, Denmark. That was the X-79 back in 1979, aptly named for the vintage year and her length. 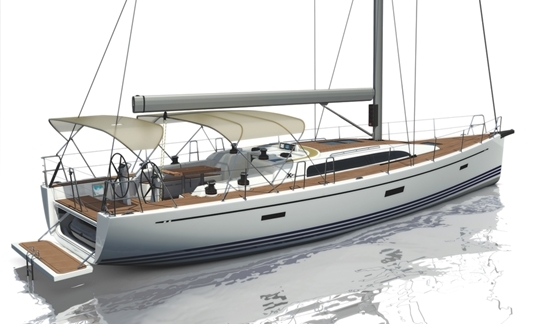 Now, 35 years on, X-Yachts is rolling out a new 35-footer. Is the name a nonchalant play on numbers, for the company’s 35th anniversary? Or, is it mere coincidence? The cool Danes shrug off this question. It turned out okay, they said. 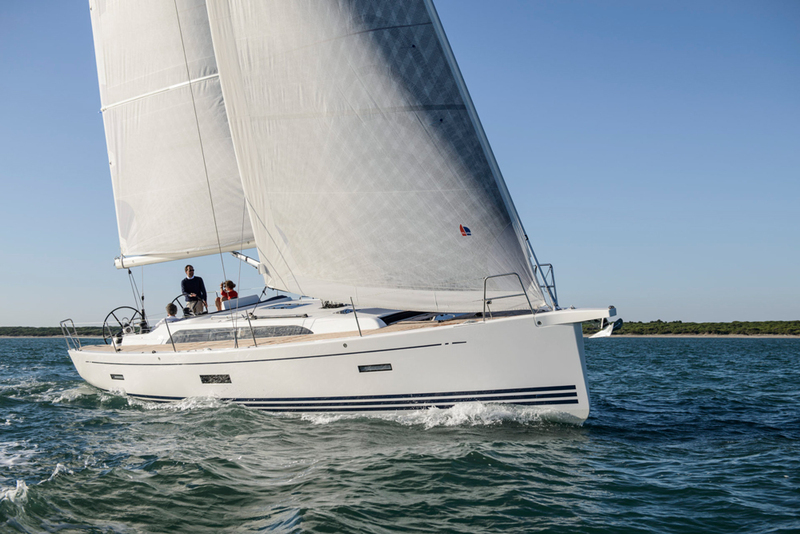 With the new XC-35 the yard has completed their cruising series at the bottom end, which now is a cleanly stepped range of boats from 35 to 50 feet of hull length. Yet there is some premeditation: In 2007 X-Yachts surprised with the announcement of a new line of cruising yachts, which were supposed to stand apart from their core business that emphasized performance up to that point. That focus shifted toward more volume, more comfort, easier handling, and more safety for cruising. Still, the most typical and important features were transferred to the new line. Thus X-Yachts skillfully endowed the new range with the firm’s unique design and a certain measure of basic sportiness. And the success didn’t lag far behind: The XC-line established itself as a lucrative division with international recognition. Two models, the XC-45 and the XC-38, won European Yacht of the Year awards. 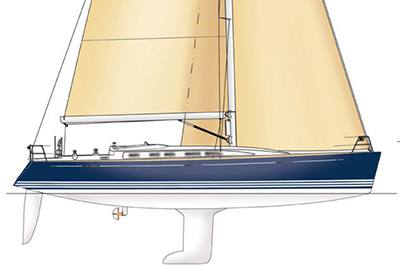 Boats drawn by company founder and head designer Niels Jeppesen display a common imprint: typical features include a slightly positive angle of the stern, the near-vertical stem, plus a marked sheer, which all combine to lend the XC-line a classic and unique look. The concept consciously does not follow the popular trend of overly-wide sterns and fashionable hard chines. Our team had a chance to get on the boat early for an exclusive test and could not have asked for better conditions: a moderate breeze, flat water, and plenty of sun. 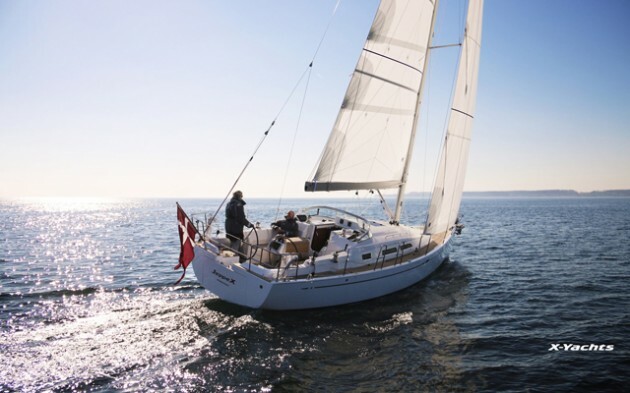 Hull number one presented itself with a spectra wardrobe from North Sails, a suitable set of canvas for this boat. 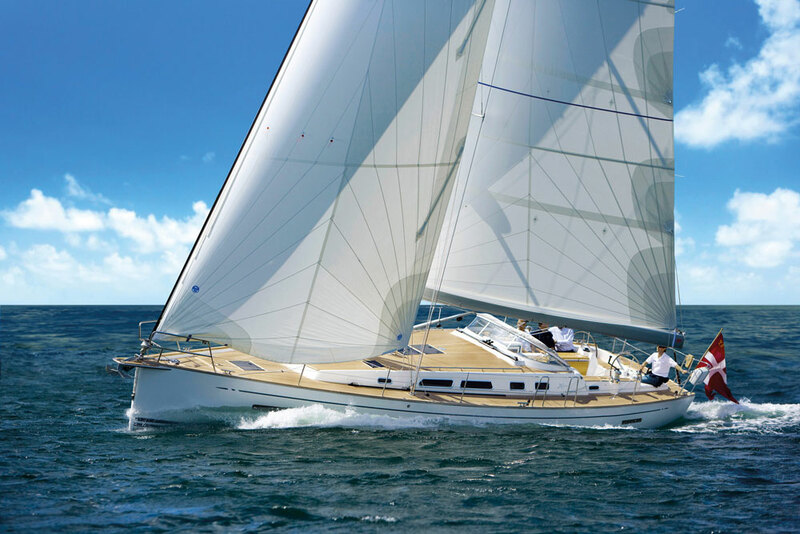 At X-Yachts, the customer chooses the sails and pays a corresponding surcharge for the desired cloth. The test boat was kitted out very similar to the production vessels and demonstrated convincing performance potential for its size and bias. For the XC-line the Danes continue to bet on shrouds that are attached inboard, closer to the coachroof. It’s an arrangement that’s not seen very often anymore in this day and age. It requires better structural reinforcements of the hull, but on the upside one can fly a larger 135-percent genoa. Specifically for this purpose the yard has added longer tracks for the jib leads. The most commonly used headsail, however, is the shorter headsail (106 percent). For motivated crews that like to play the sails, adjustable jib leads are available with barber inhaulers for fine-tuning. At 12 to 14 knots of true wind the log showed an average speed of 6.5 knots upwind, tacking through 80 degrees. However, the crew had to go about finding the groove in increments. The Jefa steering system was very direct and needed a sensitive hand, because the boat forgives few steering mistakes. This emphasizes the sporty attitude, which will be appreciated by experienced skippers who prefer an active sailing style. They should master the XC-35 faster than novices. The sails had to be trimmed constantly to reach their potential, especially the high and slender genoa. The sheeting systems and the positioning of the deck hardware are ideal for this purpose. A pair of primary and secondary winches on both sides of the cockpit coaming handles the genoa and main sheets. Halyards and control lines are led aft on the coach roof to two separate winches there. It’s a good and well-tested layout that allows inexperienced, small crews, or even singlehanders, to handle the boat. The XC-35 can be sailed ambitiously and with panache. But that’s not a must as the boat is equally well suited for leisure cruising. 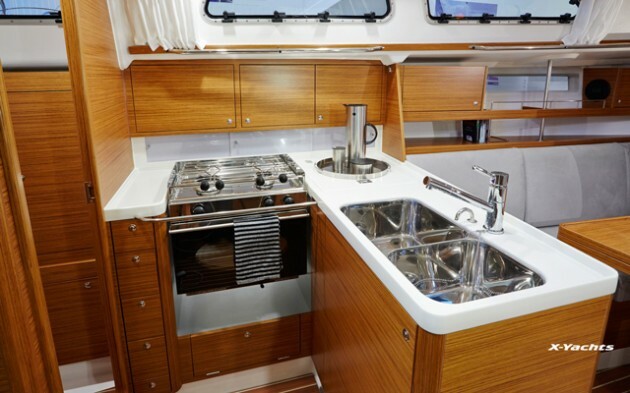 The only weak point of the deck layout and trim arrangement is the mainsheet that’s led to the top of the companionway. Because of the mast’s position farther aft, the attachment on the boom is forward of midpoint (and the windshield), which requires a lot of force during trimming the main and makes fine adjustment very difficult. In the future, X-Yachts plans to offer the option of a traveler, which should help with leach control. The test boat’s mainsheet was rigged on a simple bridle, which was not satisfactory. John Masts supplies the aluminum spar with rod rigging standard. An in-mast furling option is not offered, but a furling boom made out of GRP is available. 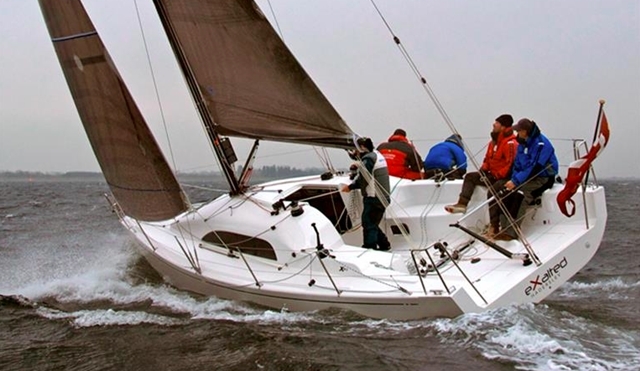 Another option is a self-tailing jib for sailors who often cruise in heavy-air venues. Just as it does with the larger cruising boats, X-Yachts also installs a steel grid in the hull of the XC-35, which stiffens the structure and passes the loads of the rig and keel into the hull in a more controlled fashion. The galvanized metal grid includes three cross-members that act as floor timbers. It’s screwed to the hull, not laminated, to help prevent tension and cracking. As it is the custom with X-Yachts, the steel grid also is equipped with a hoist point, which makes it possible to comfortably launch and retrieve the boat with a hoisting cable while the rig remains upright. The hull and deck of the XC-35 are a fiberglass sandwich with E-glass, foam core and polyester resins. The boat, by the way, is being built by a subsidiary in Poland. The XC-35 is only available in one layout with two cabins and one head. In difference to competing boats from large production yards, there’s no sensible way to install two aft-cabins because of her rather narrow stern. Besides, such a version probably won’t be in high demand for a vessel of this size. Even the larger XC-38 only offers a two-cabin interior without alternatives. The aft cabin goes beyond the centerline, but is restricted by the engine cover. Two people could lie down diagonally on the berth, which is tight. More space is available in the forward cabin where two adults can sleep in comfort. Also, the two settees in the salon double as additional berths. After removal of the back cushions (fastened by a hook-and-loop attachment), the comfortably padded surfaces are more than 6.5’ long and three feet wide wide at shoulder height. Fit and finish in the XC-35 is up to snuff, as can be seen in the galley. Positive mention should be given to the nav area. While on many competing boats the nav station is painfully reduced in functionality or omitted altogether, X-Yachts has bucked that trend by installing a large and usable desk. Just as generous is the head. Showers are taken with a pull-out showerhead and without partition, which leaves plenty of space for standing. On the other hand, the commode on the test boat was ridiculously small. The yard promised to install larger models in the future. Alas, a pass-through from the head to the large cockpit seat locker aft was missing. If there was a hatch, this large stowage area also could be reached from inside. With the XC-35, the Danes have introduced a handsome cruising boat that has a lot to offer its owners. Whether that owner leans more towards sporty or more towards leisurely, X-Yachts again proved convincingly with their latest model that they always understood how to strike that compromise. What remains is a look at the price. Well appointed and equipped by the yard, the XC-35 costs about a quarter million dollars in the base version. That’s fairly attractive, considering the competing premium builders such as Hallberg-Rassy, Nordborg or Sunbeam. 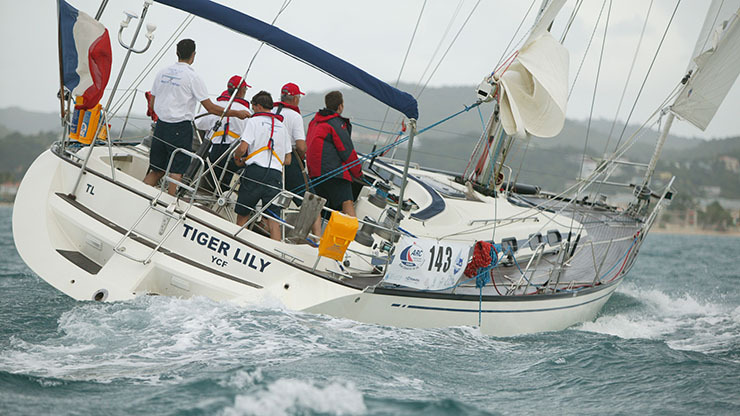 However, customers have to part with another $15,000 or so for a good set of sails. Yet still, the XC-35 will tempt more than a few sailors. 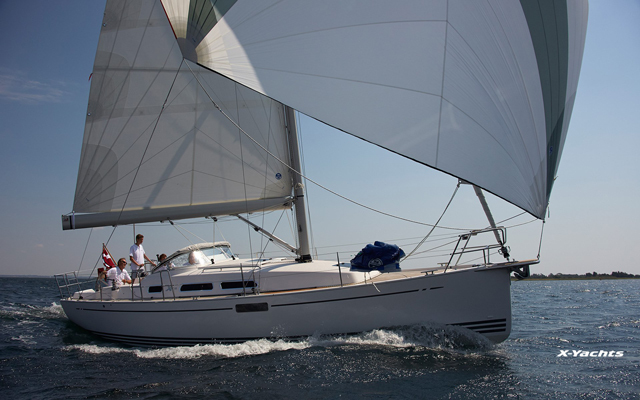 Other Choices: For a bit more beam and cruising ability at the cost of performance, you might look at a Hanse 345. 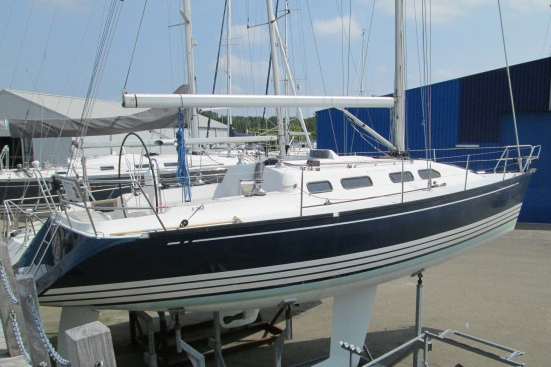 If you're willing to up the ante a bit, take a peek at the Hallberg-Rassy 372. See the First Look Video of the XC-35 (in German). This story originally appeared in YACHT magazine, and is republished here by permission.